An Artist in South Georgia contains beautiful sketches, crayons and watercolours of South Georgia's wildlife and scenery. 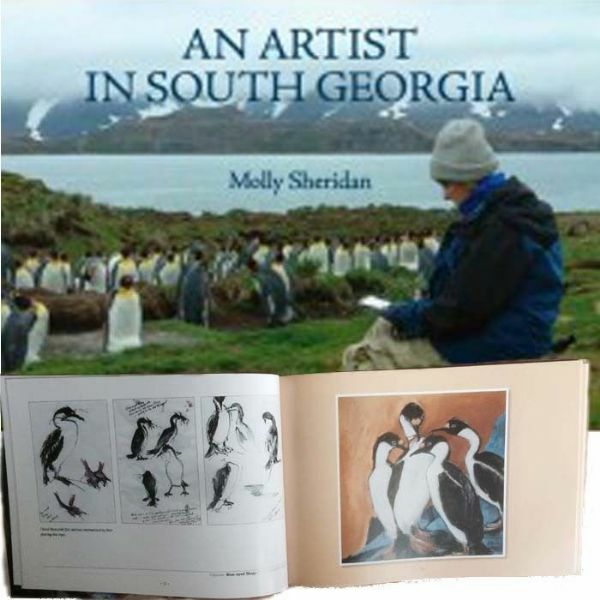 This brand new book by Molly Sheridan is a special memento of her work and the island of South Georgia. Working from a studio set up in one corner of a boatshed in the British Antarctic Survey station at King Edward Point, Sheridan made several dozen oil, pastel and watercolor paintings. But she hardly spent her three-month sojourn indoors. She travelled to isolated fjords and bays, abandoned whaling stations and remote penguin rookeries, and even taught art classes en plein air to BAS scientists. Sheridan's book reminds us again of how good artists can capture things that photographers are unable to. These sketches and paintings of seals, penguins, rusting ruins of whaling stations, and, above all, the mountainscapes of South Georgia, reveal the atmosphere and sense of the place in a way no camera can. 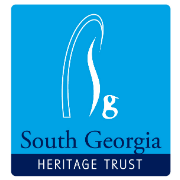 South Georgia government officials were so pleased with Sheridan's visit and its results that they are reported to be contemplating a government-backed "Artist and Writers' programme" for photographers, painters, sculptors, writers, historians and archaeologists much like the one begun many years ago by the U.S. National Science Foundation in Antarctica.